I thought I would let you guys know what my top 5 beauty products are so here goes. 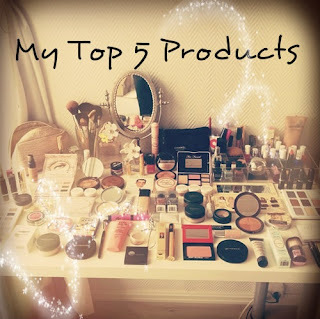 I found it really hard to choose because I have so many that I love but If I was going away to a desert island, these are the 5 products that I would take with me! Moroccan Oil - I literally couldn't live without this! I have really curly hair which I don't really like that much (even though everyone says I should keep it curly), so I straighten it loads which I know is really bad for your hair but its just so much easier to manage. Because I straighten it so much my hair is in pretty bad condition but it would be so much worse if I hadn't been using this product. I use it every time I wash my hair before and sometimes after drying (or frying) it! It helps to keep my hair smooth and tame and makes it silky and shiny. MAC Zoom Lash - I first tried this when I got it as a present and I think its great, it makes your lashes look so long and volumized. The brush is quite thin and small so its good for getting right into the corner of your eyes to make your lashes look thicker and longer and give you a more wide eyed look. Benefit Highbeam - This is my favorite highlighter. Its a pinky coloured highlighter with a slight shimmer that looks really pretty when the light catches it. I use it everyday on my brow bone and on the tops of my cheeks to lift my face and give me a glow. You can see my full review on this here. YSL Le Teint Touche Eclat Foundation - I first tried this foundation when I was given a sample whilst buying another product. The sample was tiny but it lasted me ages! I bought the full size of this foundation as soon as it was released in the UK because I was so impressed with it. It smells lovely and feels really light on your skin. It gives you a medium coverage and has the touche eclat formula in it so it gives your skin a really lovely glow. When you first apply it, its quite dewy but it you leave it for about 5 mins it has a more matte effect with a subtle glow. Love love love benefit highbeam! I really wish I could pull off the YSL because I've heard so many good things, but it just doesn't work with my oily/combo skin.